Overall Height: 36 in. (91.5 cm.) – Dimensions of Seat, heights: 20.5 in. (52 cm. ), Width: 24.5 in. (62 cm. ), Circa 18th century. The Spindleback form is derived from bamboo and rattan furniture design. The dark, sensuous quality of the grain and the subtle, magnetic lustre of the polish of zitan, prized by the Chinese since ancient times, is clearly evident in these chairs. The aesthetic appeal and sculptural quality of these chairs is further enhanced by their tapered spindles and inside aprons that become narrower halfway down the front legs, ending at the footrest. 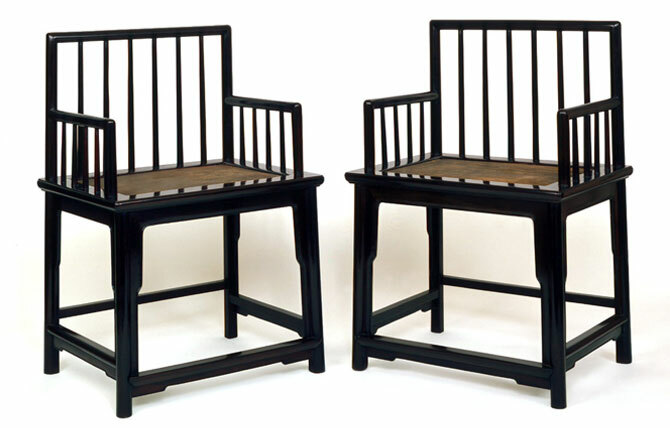 For an interesting commentary on these Zitan Chairs, Dr. Sarah Handler writes in Ming Furniture In The Light of Chinese Architecture on pages 131 to 133: "In the pair of zitan lowback armchairs, the spindleback design of bamboo furniture has been fully adopted into the aesthetic vocabulary of the hardwood furniture tradition. The allusion to bamboo furniture is successfully combined with an harmonious form. The straight beaded-edge apron extends down the inside edge of the legs tapering towards the bottom. 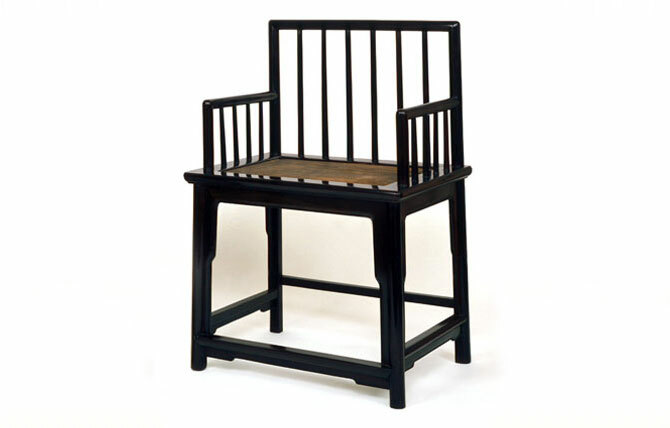 This narrowing inner frame retains a hint of the standard straight-apron and shaped-spandrels form, which is found beneath the stretchers of these chairs. But the allusion to spandrels is transformed by an elongation of their proportions and their smooth incorporation into the tapering line of the inner frame. This line continues the vertical rhythm of the spindles, which taper upward. The upward taper of the spindles balanced by the downward taper of the inner frames subtly unifies the two parts of each chair, giving movement and lightness to the form, and emphasizing the seat, the most functional aspect of any chair. The beauty of these chairs lies in the perfection of balanced proportions and the rich dark luster of the plain rounded surfaces of the wood. They have an austere luminosity that is, perhaps, unique to Ming furniture. Blind dovetail tenons join the top rail with the back posts and the arms with the front posts. But unlike other previous examples, the front posts and front legs are made from two different pieces of wood. This construction does not require such long timbers and permits the posts to be set back from the front edge of the seat, giving each chair a less stiff and lighter appearance. Lowback armchairs with back and side spindles often appear in paintings and are illustrated in the late seventeenth- century manual Jiezi Yan huazhuan (Mustard Seed Garden Manual Of Painting). Used by both men and women, in the reception hall and in the bedroom, they are light, informal seats that can easily be moved. Their low backs make them particularly suitable for placing under a window."